Rilastil Hydrotenseur Antiwrinkle Normalizing Fluid is a light emulsion, rapidly absorbed, suitable as daily antiwrinkle treatment for normal and mixed skin. 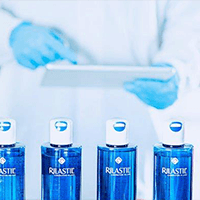 Rilastil Hydrotenseur is a product line specific for gravitational wrinkles, that acts actively on the causes forming them. Rilastil Hydrotenseur Antiwrinkle Normalizing Fluid is a light emulsion, rapidly absorbed, suitable as daily antiwrinkle treatment for normal and mixed skin. The formula, rich in selected and innovative active principles, is also enriched with Calmosensine ™, Lupeol, Vitamins E and F. Moreover, the product contrasts the Tzone skin shine (Vitamin B6) and mattifies complexion with a natural soft-focus effect. INGREDIENTS: Aqua (Water) • Glycerin • Cetearyl Alcohol • Diethylhexyl Carbonate • Helianthus annuus (Sunflower) Seed Oil • Bis- PEG/PPG-16/16 PEG/PPG-16/16 Dimethicone • Polymethyl Methacrylate • Glyceryl Stearate • PEG-100 Stearate • Butyrospermum parkii (Shea) Butter • Sodium PCA • Oryza sativa (Rice) Bran Oil • Olea europaea (Olive) Oil Unsaponifiables • Arginine • Ceteareth-25 • Caprylic/Capric Triglyceride • Carbomer • Dimethicone • Tocopheryl Acetate • Sodium Hyaluronate • Retinyl Palmitate/Carrot Polypeptide • Ceramide NP • Ceramide AP • Ceramide EOP • Sodium Lauroyl Lactylate • Oryzanol • Diglycerin • Urea • Pyridoxine HCl • Ethyl Linolenate • Ethyl Oleate • Ethyl Linoleate • Hydrolyzed Rice Bran Protein • PCA • Sorbitol • Laureth-3 • Lysine • Allantoin • Lactic Acid • Phytosphingosine • Cholesterol • Lupinus albus Seed Extract • Acetyl Dipeptide-1 Cetyl Ester • Helianthus annuus (Sunflower) Seed Extract • Vitis Vinifera (Grape) Leaf Extract • Hypericum perforatum Flower/Leaf/Stem Extract • Arnica montana Flower Extract • Hamamelis virginiana (Witch Hazel) Leaf Extract • Aesculus hippocastanum (Horse Chestnut) Leaf Extract • Hedera helix (Ivy) Extract • Hydroxyethylcellulose • Xanthan Gum • Octyldodecanol • Hydrogenated Coco-glycerides • Tocopherol • Butylene Glycol • Phenoxyethanol • Chlorphenesin • o-cymen-5-ol • Ethylhexylglycerin • Potassium Sorbate • Disodium EDTA • Pentaerythrityl Tetra-di-t-Butyl Hydroxyhydrocinnamate • Parfum (Fragrance).